I was too little to remember the events that began to unfold on July 10th, 1973 when John Paul Getty III (referred to as Paul), the grandson of famous billionaire J. Paul Getty was kidnapped and held for ransom. But with the recent release of a movie directed by Ridley Scott titled “All the Money in the World”, I became well-versed on this tragic story that totally surrounded one man’s terrible greed. This movie was riveting, disturbing, and well-acted, which I found even more astonishing given how J. Paul Getty was originally played by Kevin Spacey. But in light of the many sexual allegations that had been brought against Spacey, Scott did the unthinkable and reshot every one of his scenes with Christopher Plummer in the role instead, all in the space of 22 days, for a release date that was shortly thereafter. One might think this would come off quite sloppy in the final cut that was shown in theaters beginning Christmas Day, yet I found Plummer to be far more alluring and convincing as J. Paul Getty, than from what I saw in each of the trailers Spacey was first in. Regardless, this movie was a great reminder of why I feel money is the root of all evil in so many ways and poison to one’s spiritual journey. Watching J. Paul Getty be more consumed with saving a buck than his Grandson’s life, someone he claimed he truly loved and cared about, was really hard to stomach. A $17 million ransom was technically change in J. Paul Getty’s bank accounts and was probably earned in interest in a matter of hours on any given day. Yet, he could only ever see things in dollar signs and overlooked the importance of a human life because of it. Sadly though, I could relate to a time I acted similarly in my own life. When I used to own my own business, and had a substantial income, I was pretty darn cheap and did everything I could to save a buck. Some of which often came at the expense of others I claimed I cared about. But you see that’s what happens when you have a lot of money. It’s never enough, you always want more, and you constantly are looking over your shoulder at who might be wanting to take some of it from you. That’s the sick part of money and something one never knows of until they have a lot of it. That’s why I’m glad I lost pretty much everything back in 2010, because I eventually learned how I was no better than someone just like J. Paul Getty. Thank God for that and thank God I’m not like that anymore, as I value human life far more than I do a dollar sign. 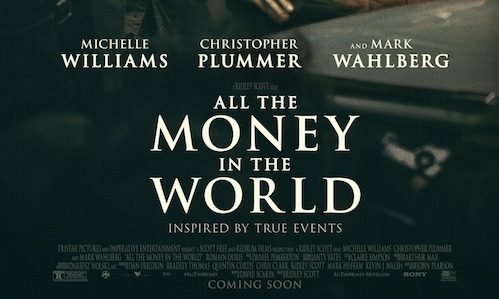 Nevertheless, “All the Money in the World”, is definitely an awards contender. And while I’m sad to see the depth of the tragedy that John Paul Getty III went through in his life, the film was truly a great portrayal of how greed robs the soul of its goodness and poisons the mind of the individual who chooses to wield it.